Powers/Abilities: Extremely strong, able to fly. Able to call for his uncle, who seems to be able to hear him no matter how far away he is. 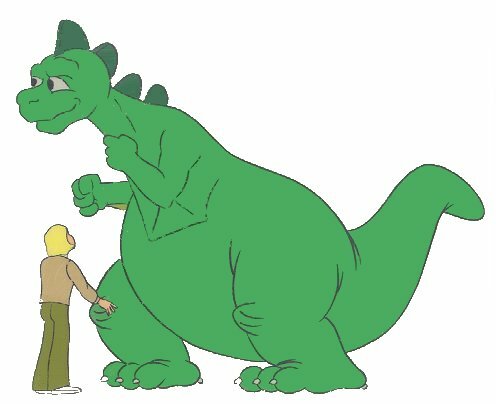 History: Godzooky was the nephew of the giant "kaiju" (monster) known as Godzilla. A friendly and inquisitive creature by nature, he befriended a young boy called Pete and followed the lad as he travelled around the world on the Calico with his scientist uncle, seeking out stories of other kaiju. 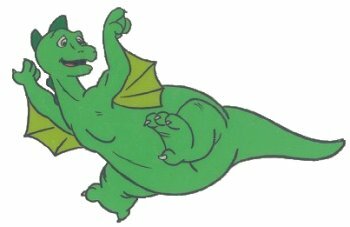 Inevitably most of these were hostile towards humans, and Godzilla would be called in to save the day, either by the humans using a signalling device, or by Godzooky himself. Comments: "Voice" (noises, really) provided by Don Messick. Normally I'd have listed Godzooky under his uncle's entry in the Japanese section, but frankly poor Godzilla has been through enough indignities at the hands of the Americans, without adding insult to injury.